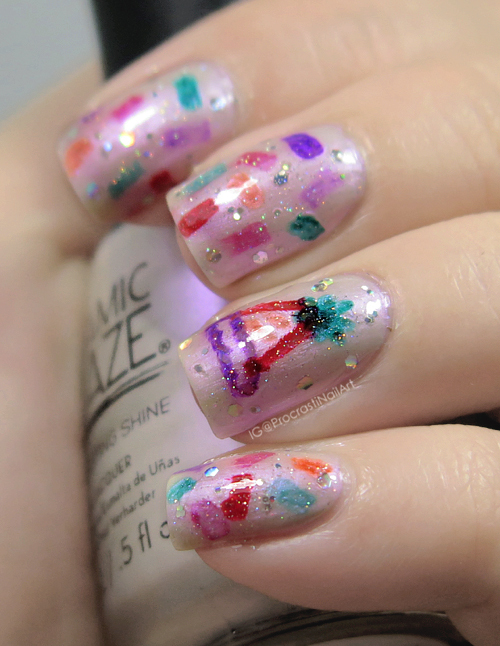 Nail Art // The Digit-al Dozen Turns Five: Sharpie Confetti Party! 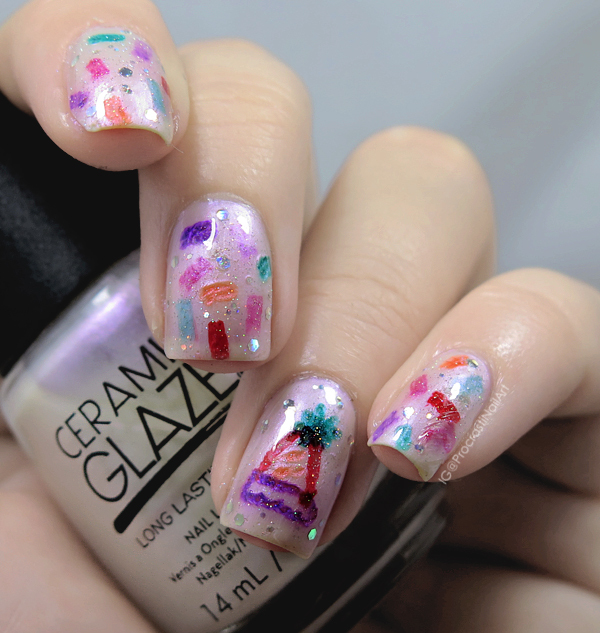 It was supposed to be a pond mani (the confetti was done over three separate layers) with confetti falling all over, and a freehanded party hat on the accent nail. I think part of my problem was making the confetti too big, and a few times I didn't let the layers dry long enough so when I used the sharpie it would dig into the polish a little bit. Bah! Because I'm not a fan of this mani you get limited pictures of it. Haha. Sorry! I started off with a base of Ceramic Glaze Heavenly which is a sheer white with pink shimmer (swatches here). When it was dry I drew on a few pieces of confetti, waited for them to dry, applied another layer of polish, and repeated. In totally there are three separate layers of confetti. For the party hat I used the same sharpie colours and went for a minimalist look. Since I didn't love this I went with the idea of "throw glitter at it and it'll be better!" so I added some loose hex glitter and put on a layer of China Glaze Fairy Dust to add a little extra something to try to save it. It definitely helps, but I still think overall this is a nail fail for me. Ah well. Check out all the (actually amazing) looks from the other DD ladies below! I think they are still fun and festive! This is a fun look, I should really try sharpies for nail art!